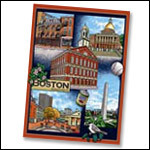 Large woven 100% cotton coverlet with scenes of Massachusetts. Large 60" x 48" design, expertly-crafted, combines rich color and fine detail. Variously called throws, blankets, afghans, or lap rugs. Fringed on all four sides. Machine washable, color fast, shrink resistant and woven in the USA. 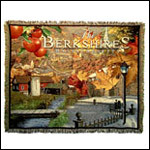 The Massachusetts images on this throw include: Autumn foliage, old water mill, harbor lighthouse, the north bridge at Concord (scene of the opening shots of the revolution), Plymouth Rock (bearing the year 1620), cranberries, and coastal scene.